Did you know that Neem tree oil can be used as pesticide for controlling pests on house plants or as a shampoo for your dog? Face it, no one wants to deal with the subject of pests. However, it is a topic needing attention no matter what type of plant you own, from peace lilly to cactus controlling pest, safely for the plant, you and the environment needs consideration. Everyone grower handles it different. I prefer whenever possible to use natural products like neem oil as a pesticide in my application of chemicals used. Chemical safety is becoming a bigger issue all the time. I like to always use the best product for the job, with the product being safe for people and the environment. The does not always mean chemicals it could also be a natural solution such as beneficial insects. The problem with pests on house plants comes down to few safe choices for use indoors with pesticides/insecticides. Plants maintained in malls now look to using beneficial insects for mealy bug, mites and scale control. This is called Integrated Pest Management or IPM. With few choices what do houseplant owners do? What pesticide alternatives do they have? While researching natural pest control options for use in the nursery I found a natural orgainc product which appears both safe and covers a wide variety of uses and pests. Neem oil comes from the Azadiracta indica Juss tree, let’s call it Neem tree for short. This tree native to Burma and eastern India. The seed when pressed produces the oil which has been used as medicine and pest control among the India population for thousands of years. Not only are the seeds utilized but also the leaves and tree bark. Here’s just a few things Neem Oil is used for! Massage: The oil claims to numerous medicinal properties producing a stimulative and antiseptic effect for use in body massage. Skin: Neem is used as a natural skin moisture and protectant with antibacterial compounds. Neem oil is also used to treat sprains, bruises and cuts for centuries. Fungus diseases including black spot, rust, mildew and scab have also been reported to be controled with Neem. Neem can be used on House plants, flowers, vegetables, trees, shrubs and fruit indoors and outdoors. 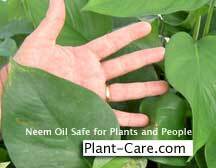 How Safe is Neem Oil? Neem products are consumed by humans and used in medication. When treating your plants for pests exposure to neem looks like a non-issue for you, the plants or the environment. Currently there are no restrictions put in place by the EPA. Growers I’ve spoke with using neem oil in their “pest control” program like it from a control perspective and employee safety point of view.. They’ve reported neem oil to be effective as a fungicide, repellant, insecticide and miticde. It works to discourage insects feeding patterns. It appears that insects would rather die than eat foliage and plants treated with neem oil. Neem extracts prove successful also in battling problems with root rot. Keep in mind Neem when exposed to sunlight can biodegrade in a matter of weeks. There is much more information on neem oil on the internet. Use your favorite search engine to learn more. Neem oil looks like a Safe, Natural product and a great solution for plant owners with any type of pest problems. I appreciate the information, I have been researching about this neem for the past 14 years, definitely neem oil is a great pest repellent. Not only for the plants it can be applied also in big farms where it increases the returns for the farmers.